Ion chromatography (IC) analysis is a simple, fast and accurate way to ensure that your product is clean, safe and of the highest quality using the separation and quantification of anions and cations using High Performance Liquid Chromatography (HPLC) and a conductivity detector. HPLC is an analytical technique based on the separation of the components of a mixture in solution by selective adsorption. There are basically three modes of separation: liquid/liquid, liquid/solid, and molecular size. Once the components have been separated, they are measured by a conductivity detector. Learn about Innovatech Lab’s ion chromatography lab services or contact us to speak with one of our highly skilled analysts. IC analysis can be used to determine either or both qualitative and quantitative conclusions about a material’s composition. Material identification is accomplished via IC by comparing a sample’s results against those of known reference-materials. Quantitation, or quantification of concentrations, is achieved by comparing each anion’s or cation’s peak area in the chromatogram to a standard curve of known concentrations. 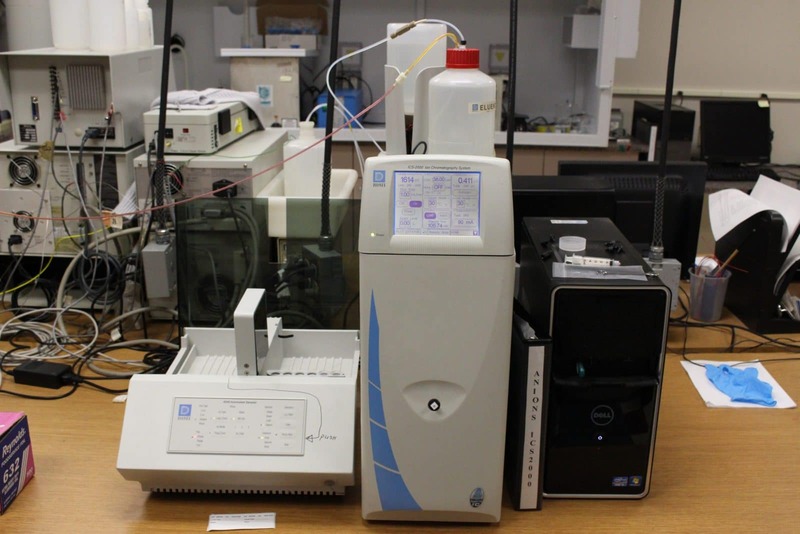 IC analysis uses a High Performance Liquid Chromatography (HPLC) system equipped with a conductivity detector to separate anions or cations. The ions in a sample are moved through the system in solution and then the various ions are separated in a column with an ion-exchange resin. The resin’s surface layer has limited ion-exchange sites that attract either anions or cations. A conductivity detector at the end of the column measures the quantity of exiting ions, and from this data a chromatogram is produced. 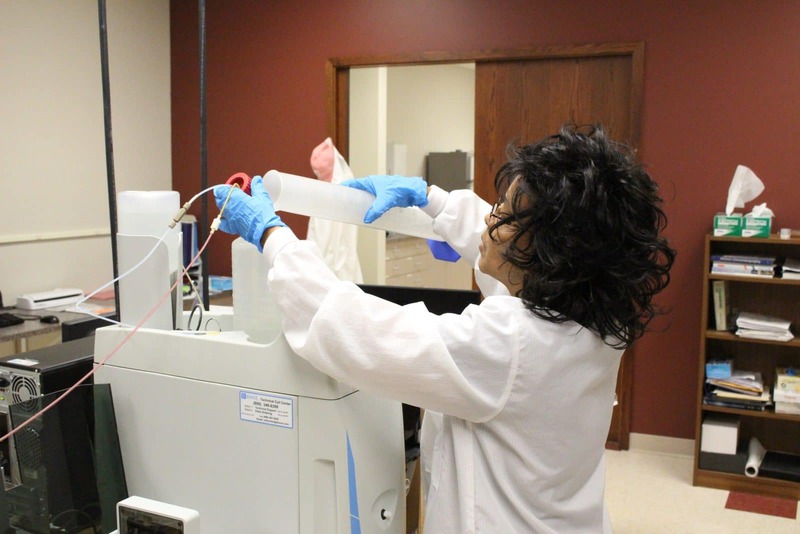 Once the chromatograph is produced, contaminants can be identified and quantified. To identify contaminants, the sample’s chromatograph is compared to that of a known reference material. To quantify, the peak area of each anion and cation in the chromatogram is compared to a standard curve of each species’ known concentrations. While the process sounds complex, the analysis is actually simple and fast. Innovatech Labs can often deliver results in just one business day. Sample preparation – The sample or components of interest must be suspended in solution. Feed injection – The sample is injected into the carrier fluid. Separation – Ionic separation of the sample takes place. Exiting of components – The components exit (elude) from the column, beginning with those least bound to the stationary phase. Detection – The eluted components are collected and analyzed by measuring conductivity. Chromatogram – A chromatogram is produced that plots the peaks representing sample components. Why is IC Useful to Manufacturers? Ionic contaminants can cause products to fail or not work as they’re intended. They can also compromise the safety of a product. Let’s say you’re an electronics manufacturer who is experiencing electrical shorts in your circuit boards. You suspect that the rinse water being used is the culprit, but you’re not sure. Ion chromatography can be used to extract a sample from the circuit board and determine whether contaminants left from the rinse water are to blame. As another example, product cleanliness is incredibly important to medical device manufacturers because their devices are meant for human implantation. Any contaminants could cause slow healing times or infection, device failure or harm the person it’s implanted in. IC analysis can identify any ionic contaminants and help trace the contamination back to a step in the manufacturing process. Where and When Can IC Be Used? IC analysis is often used in the environmental, industrial, biological, pharmaceutical, chemical, electronics and food sectors. Ensuring product safety, quality and cleanliness is essential for every manufacturer. Ion chromatography analysis is an effective and fast way to meet all those needs. Modern gas chromatography was invented by Martin and James in 1952. It is estimated that using gas chromatography enables separation and determination of approximately 20 percent of known chemical compounds. It was necessary, therefore, to develop and validate new methods to extend the scope of these chemical compound parameters. 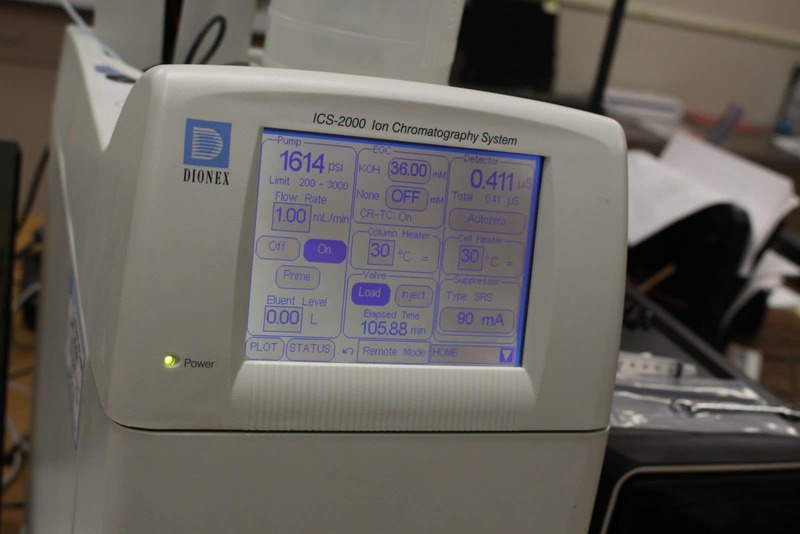 Since liquid ion chromatography enables separation and determination of approximately 80 percent of known chemical compounds, liquid chromatography, including ion chromatography, came to the forefront. A recent article in the environmental analysis magazine, AWE, describes how ion chromatography had its actual beginnings in 1975, when Hamish Small, Timothy Stevens and William Bauman of the Dow Chemical Co. in Midland, Mich. published a landmark paper on the topic. In September of that year, at a meeting of the American Chemical Society, the first commercially available instrument for performing ion chromatography was exhibited. What’s the Difference between GC/MS and Ion Chromatography?